At the Hart Building, we stood in silence for 33 minutes – one for each day of the shutdown which began Dec. 22 and dragged on to its fifth week Jan. 21. Furloughed workers explained to reporters how they couldn’t pay rent, mortgages, food, and other bills because of the shutdown. Some expressed disbelief that they were being held hostage for something that had nothing to do with their work. Twelve union leaders and allies, including our very own AFGE President J. David Cox Sr. and Political Director Tucker McDonald, were arrested outside McConnell’s office as they refused to leave without meeting McConnell. “Where is Mitch?,” they chanted, highlighting the role he played as a co-conspirator in the shutdown. Protesters also visited several senators’ offices to pressure them to immediately open the government. See the Occupy Hart photos here. Employees from the TSA, Department of Interior, Census Bureau, and Veterans Affairs participated in the protest, which was organized by AFGE. In St. Louis, Missouri, AFGE members and allies lined the sidewalk in front of the Federal Center to call for an end to the shutdown that has devastated their finances. “Stop the shutdown! We want to work!” they chanted. In Jacksonville, Florida, AFGE members and allies gathered downtown chanting “End the shutdown, call the vote!” Furloughed workers took turns telling their stories about how the shutdown has affected them and their families. 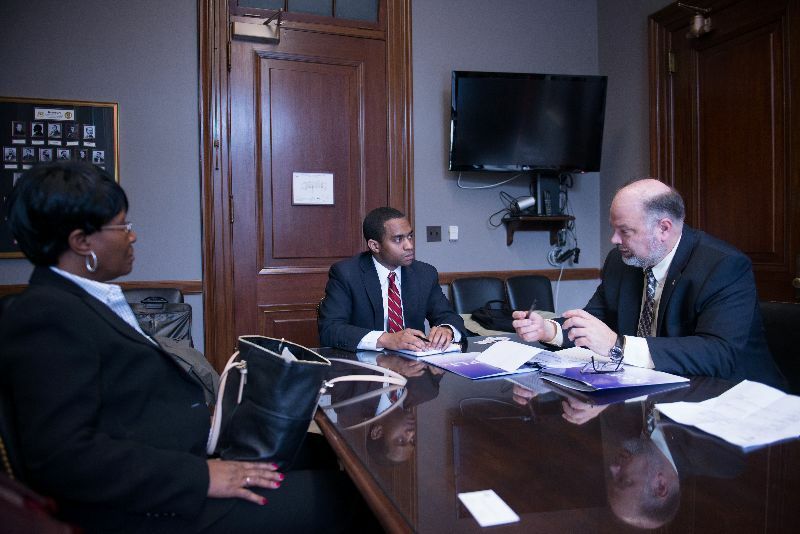 In addition to AFGE, members from more than 10 unions participated, including teachers, electricians, and Teamsters. AFGE Council of Prison Locals, which represents over 33,000 federal correctional workers nationwide, took out a series of billboards in Kentucky highlighting the damaging effects the longest government shutdown in U.S. history had on law enforcement and holding Senate Majority Leader Mitch McConnell of Kentucky accountable for his role in the standoff. McConnell’s stronghold has five federal facilities in the state - two are United States Penitentiaries. The billboards were placed at strategic points along major highways in Kentucky. They feature informational messages about the pain this shutdown is causing federal correctional workers and a call for Mitch McConnell to end the shutdown by bringing H.R. 21 to a vote on the floor of the Senate. 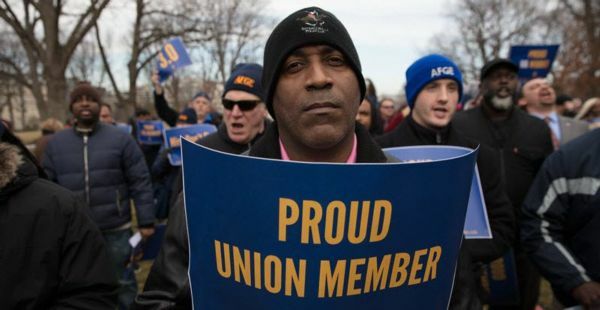 The coordinated efforts of AFGE members and our allies in the labor movement and beyond helped bring this standoff to an end with a temporary funding measure that reopened the government through February 15. But Congress must act soon to make sure this doesn’t happen again in three weeks. 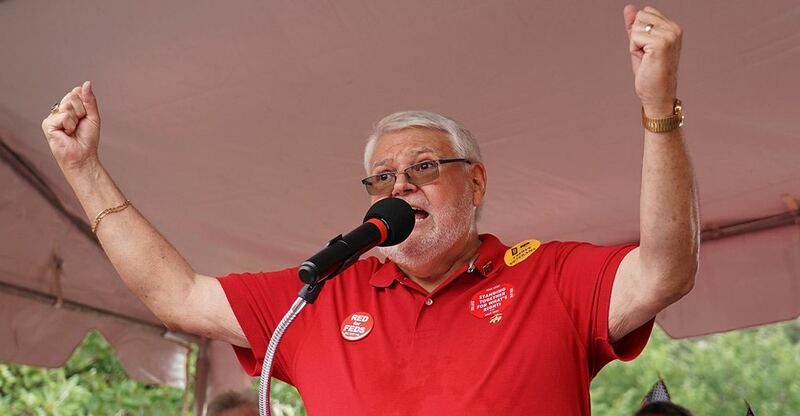 “While reopening the government is long overdue, I will not celebrate a temporary reprieve to a politically motivated crisis that has left many federal employees in anguish over how to pay their bills, feed their families, and keep a roof over their heads,” said AFGE national president J. David Cox Sr.
We need you to continue to contact your member of congress and senators to keep up the pressure in the next three weeks to make sure that a minimum 1.9% increase is included in the final funding bill for the rest of 2019. Rep. Gerry Connolly (D-Virginia) has also introduced a bill with Leader Steny Hoyer (D-Maryland) to provide pay parity and provide federal workers with a 2.6% increase, the same as the military increase. This increase would help address some of the late fees, penalties, loans, and interest fees that workers accrued during the 35-day government shutdown. Contact your member of congress and urge them to cosponsor the bill, H.R.790. Our calls, visits, and protests resulted in Trump and Congress coming together to reopen the government. Let’s keep the pressure on so we get the raise we’ve earned! WASHINGTON – Following the Supreme Court’s decision to overturn 40 years of constitutional law that ensured public-sector workers benefited from the collective voice of union representation, the head of the largest union representing federal workers says employees will need to come together to preserve their workplace rights. “On May 25, President Trump issued a series of executive orders targeting federal employees’ collective bargaining and due process rights. And now the Supreme Court has issued a decision that jeopardizes union rights and protections for millions of public-sector workers at the state and local levels, and here in the District of Columbia,” said J. David Cox Sr., national president of the American Federation of Government Employees. Major Win for AFGE. EO Opposition Grows: Senators Release Another Letter Blasting Attacks June 25, 2018 8 Categories: Congress , The Insider , Executive Orders More members of Congress are speaking out against the White House’s attempts to undermine the U.S. Constitution and laws providing checks and balances in the federal government. New law would revive panels disbanded by President Trump WASHINGTON – The American Federation of Government Employees fully supports legislation introduced in the House and Senate that would establish in law a national council overseeing labor-management relations in federal agencies. Twenty-five years ago on Feb. 5, 1993, President Bill Clinton signed into law one of the most important pieces of legislation for working families – the Family and Medical Leave Act (FMLA). Union opposes cuts to Federal Retirement Benefits Union opposes cuts to Federal Employee Retirement Benefits (both FERS and CSRS) as proposed under the President's FY 2018 Budget. When working people come together, they make things better for everyone. Joining together in unions enables workers to negotiate for higher wages and benefits and improve conditions in the workplace. There are millions of union members in America from all walks of life. These individuals know that by speaking up together, you can accomplish more than you could on your own. The gains working people make at the bargaining table are strengthened by good laws that protect against exploitation. Corporations use laws to increase their profits by weakening working people’s rights and safety. The legacy of strong unions has led to weekends, overtime pay and the end of child labor. That’s why union members continue to raise their voices to be heard from the worksite to the White House. We are a watchdog for working people. Unions give a unified voice for all working people by advocating for legislation and regulations that keep us safer, healthier, and enjoying a higher quality of life. Many union members are politically engaged. We advocate for the public servants who will best serve the interests of working people at all levels of government. Together, we are re-writing the rules of the economy, so they benefit the 99% instead of the wealthy few. We also advocate for an expansion of voting rights. We need to make participatory democracy easier and stop the racist laws that keep all people from accessing their right to vote.